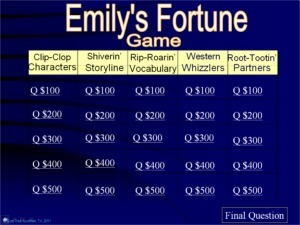 You can purchase the 33-page unit PLUS a Jeopardy-type game for Emily's Fortune for immediate download for only $15.95! By the time Emily Wiggins was 8-years-old, she had already had her share of MISfortunes. Her father had died in a riverboat accident when she was just a baby. Her mother had to go to live and work for the little-bit-too-rich Miss Luella Nash who would not let Emily play, or work, or go to school for fear she would learn bad words. Not only that, but Emily was not allowed to make noise or even talk above a whisper because Mrs. Nash believed that children should be seen (as little as possible) and not heard. So, during her childhood, Emily didn't learn much except how to be quiet and clean. A proper lady in every way, Miss Nash did have one fatal vice: she drove her carriage like a crazy person. One day while Emily's mother rode with her, Miss Nash caused the accident in which only the horse survived. That made Emily Wiggins an orphan...which led to a set of even bigger problems, not the least of which was that she had to figure out how to protect her best friend, a turtle named Rufus, from the person who was trying to kill them both. In the process, she got linked up with a mannerless, rude boy, met up with bandits, had to survive stagecoach accidents, and got tangled up with a pastle of other problems. Get ready for a wild romp through the Old West in Emily's Fortune, a story that will delight readers of all ages. Every chapter ends with a cliff hanger peppered with alliteration. Yummy onomatopoeia lets you hear the action. Ross Collins's terrific black and white drawings invite even younger folks to enjoy the fun! 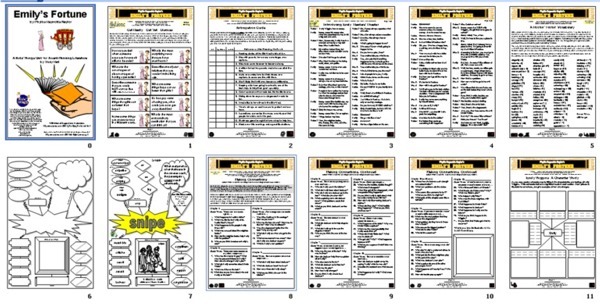 The Kids' Wings literature guide invites group discussion, problem solving, research, writing, skill building, and authentic writing prompts and a culminating interactive Jeopardy-type game. Teachers who want students to enjoy the fun of a fast moving story set in the Old West will want make this book part of their classroom libraries. 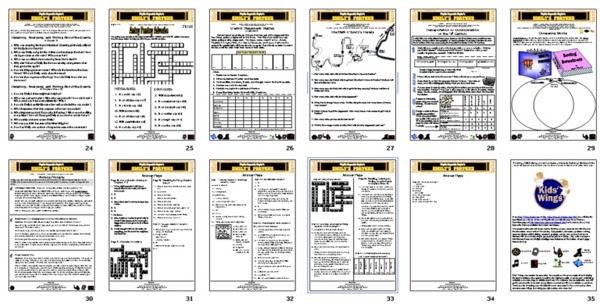 A 33-page unit PLUS interactive Jeopardy-type game, perfect for lesson planning, handouts, or projection on your SmartBoard for Emily's Fortune by Phyllis Reynolds Naylor is now available! Emily's Fortune is one of the 26 literature guides in Extraordinary Destinations . While you can purchase the individual literature guides for about $19.95, if you order Extraordinary Destinations , you can get the entire collection in a spiral-bound book with CD and site license for one school and pay less than $1 a unit in the collection! Buy Emily's Fortune by Phyllis Reynolds Naylor NOW!